What are the scores on the DOOORS? Imagine this: you wake up one morning and find yourself in a windowless, white room with nothing but a screwdriver in your pocket and a scrap of paper that contains a bizarre sequence of numbers. Upon closely examining the only door, you find it locked and there's no obvious keyhole. What do you do? 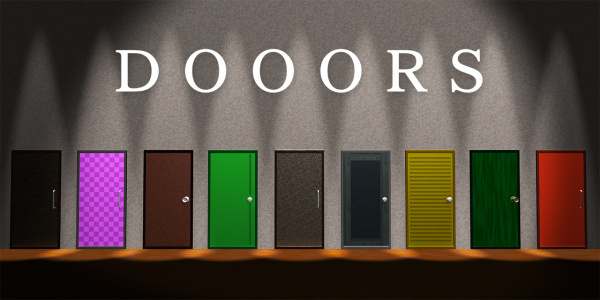 If problem solving your way out of a situation such as this sounds like a fun challenge, then DOOORS is the game for you. Though it occasionally suffers from pacing issues, DOOORS is a fun, quirky game of logic and reasoning that encourages gamers to think out of the box. The premise of each level is simple. 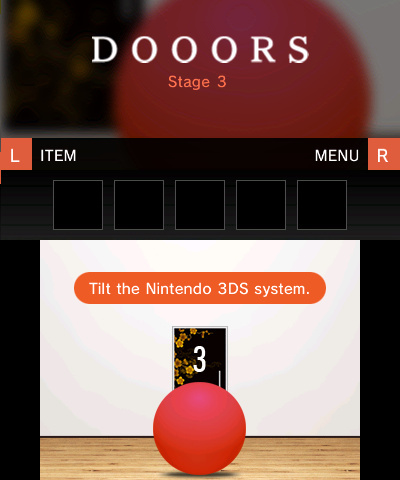 A locked door emblazoned with the current stage number sits at the centre of the bottom screen and it's up to the player to figure out how to open it by using subtle hints that are to be found in the surrounding environment. These can be as overt as images of the four face buttons lined up in the order they should be pressed, to as obscure as three coloured dots on the wall. The rooms can be frustrating at times, but the player always has a diverse set of tools to attack the problem. While the touch screen (used in a point-and-click method) is the primary system of control, the face buttons, D-pad, gyroscope controls and even the microphone can potentially be used to unravel the secrets of the overall puzzle. On top of this, various items and tools found in levels can be used to interact with the environment, such as when a black light is used to find invisible symbols on a wall or a screwdriver is used to loosen up screws on a panel. By clever usage of trial and error, the player can usually arrive at an answer before growing frustrated and giving up, but this is where the main flaw reveals itself. The difficulty of the levels is not a consistent, gradually ascending curve, but a jagged line that dives and jumps seemingly at random. 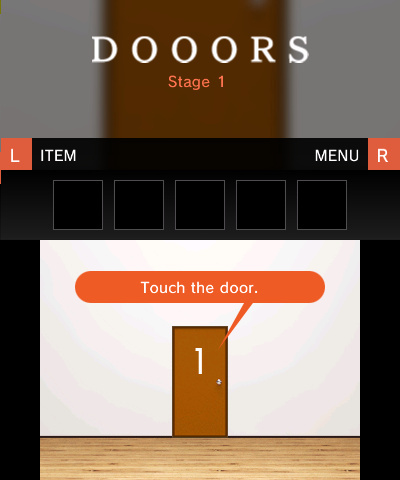 After spending the better part of twenty minutes figuring out a room, the player may very well find the next to be an extraordinarily simple task, such as tapping a row of buttons and opening the door before one of the buttons pops back up. Some may see this as a much appreciated break, but it makes many rooms seem out of order and gives the overall experience a somewhat chaotic and unpredictable feeling. Pacing issues aside, the challenges never seem outright unfair and the "aha!" moment always makes the struggle worth the effort. With a total of eighty rooms to be solved, there's plenty of diversity in the puzzles and the whole thing is over just before the point that it wears out its welcome. However, outside of a few memorable puzzles there's little reason to go back and replay any of the rooms, as the player already knows the answers. Perhaps a time attack mode would've been able to round out the package a bit more in this respect, but it's still a solid experience. 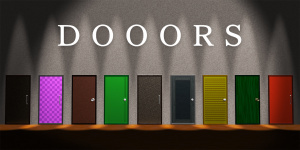 Overall, DOOORS is an enjoyable, mind-bending puzzle game that encourages gamers to use unconventional thinking to problem solve their way through its numerous challenges. While the difficulty of these challenges can unpredictably spike at times, the whole experience is rewarding and inventive enough to be worth the time and effort. Sounds quite interesting, might give it a try if it reaches my area. The change in difficulty is likely by design. A lot of puzzle games do this to keep a player from becoming too frustrated...so they follow a tough puzzle with a relatively easy one. It helps with the sense of progress. I've read some designers write about it. This is just a rip-off of the iOS game 100 Floors! @Supermak99 Actually, it appears that this is a fairly popular series on smartphones. There's 3 others. Sounds interesting. Hopefully it will make it's way to the EU soon. I personally hate when I see a smartphone game ported over to the 3DS. This includes how the final fantasy games got the same treatment. To me, there's just something about it that makes it lose its value and depth. Therefore, I will always prefer a dedicated handheld gaming device for actual games rather than little throwaway experiences. @Supermak99 And 100 Floors rips off dozens of earlier Room Escape games that had already been around since the early 2000s. It's a whole genre. I'd hardly say any of those rip off another game more so than others do. I would get it but the title doesn't have enough O's. @The__Goomba It has too many O's for me! Price is incorrect. Actually is $ 3.99(USA). Another game that just looks like a boring phone game. I'm glad it's not shovelware despite the fact that it looks like shovelware. Still not convincing enough for me to buy though. 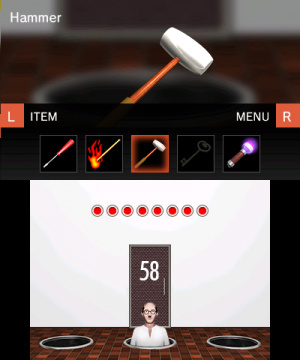 Stuck on door 49, help! The game is ok but I wouldn't really recommend it. Imo 5$ is way too much for what this game has to offer. @EvilTediz IIRC that's the one with the bucket of water and the weight. Put the weight on one hook and the bucket of water on the other, then tilt your 3DS forward. The door will fall out of the frame. Ah, I was missing the tilt forward part. Thanks!